optical communication — EVIL ROBOT MFG. CORP. Researchers at UC Davis have manufactured a device that can convert light pulses into electronic signals and back that is up to 10,000 times faster than existing technologies, leading the way to ultrafast, high-capacity telecommunication and advanced three-dimensional imaging systems. Boosting the frequency of light pulses is a key requirement to increasing data transfer speeds in optical communication, as this means more information can be packed into a given unit of time. 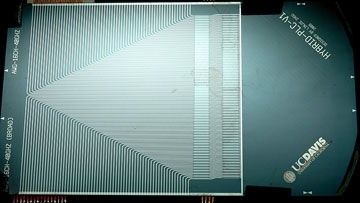 The device designed by the engineers at UC Davis divides the incoming signal into slices of frequency spectrum, processes the slices in parallel and then integrates them into a single signal, a process also known as frequency domain multiplexing (FDM). The system can work at much higher frequencies than normal because it can simultaneously measure both the intensity and the phase of a light pulse, boosting bandwidths from the typical tens of gigahertz, which is the ultimate limit that electronics alone can reach, into the 100 terahertz range. "We have found a way to measure a very high capacity waveform with a combination of standard electronics and optics," explained S.J. Ben Yoo, professor of electrical and computer engineering who was part of the research group. Apart from faster communication, the team's work could also find application in light detection and ranging (LiDAR) systems, which employ rapid successive pulses of laser light to scan a three-dimensional surface and produce highly detailed images of the Earth's surface. The next step, according to the researchers, is now to try and fit the entire device into a silicon chip. The research was funded by grants from the U.S. Defense Advanced Research Projects Agency. A paper describing the technology was published Feb. 28 in the journal Nature Photonics.